Review on "Architects and Artisans"
Book review written by Mike Welton entitled "The Values of Historic Preservation"
Winner of the Society of Architectural Historians' 2013 Antionette Forrester Downing Book Award, this provocative analysis of historic preservation's past and future will transform contemporary understanding of the movement. 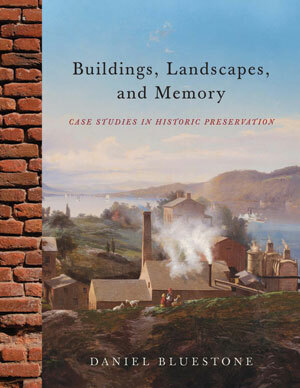 Buildings, Landscapes, and Memory: Case Studies in Historic Preservation explores historically and critically the historic preservation movement in the United States. Analyzing ten extraordinary places, this provocative analysis of historic preservation’s past and future will transform contemporary understanding of the movement, examining assumptions about why history, heritage, and place should matter. It ranges broadly from a discussion of the commemoration of place in the Marquis de Lafayette’s triumphal tour of the United States in 1824–25 to speculation about the cultural and political import of interpreting history on EPA Superfund toxic waste sites. Thinking critically about preservation requires also thinking critically about its opposite: destruction. The book treats the movement to conserve the Hudson River Palisades from destruction at the hands of trap rock quarrymen as well as the effort to save Dutch-American homesteads that stood in the path of development in Brooklyn. It explores the intersection between race, culture, and preservation in the 1940s effort of African Americans to preserve the Mecca Flats in Chicago, an apartment building that was the subject of popular blues music and that was threatened by Mies van der Rohe’s designs for the Illinois Institute of Technology. Focusing on the relationship among tradition, preservation, and modern design, Buildings, Landscapes, and Memory explores the making of Eero Saarinen’s Jefferson National Expansion Memorial Arch on the historic Mississippi riverfront in St. Louis as well as the tension between tradition and modern design at Thomas Jefferson’s University of Virginia, declared a World Heritage site in 1987. Engaging early efforts to build an economy on preservation and heritage tourism, the book also looks at the creation of Virginia’s historic highway marker program in the 1920s.